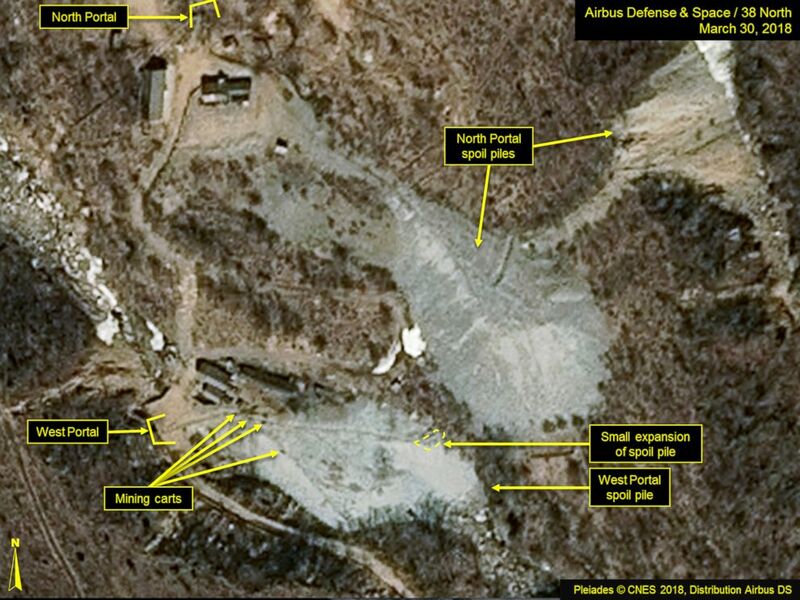 North Korea has promised to begin breaking down its nuclear test site this week. North Korea has vowed this week to dismantle their nuclear testing facility at Punggye-ri in front of the world’s media, the latest sign of goodwill in the rapidly developing detente on the Korean Peninsula. North Korean news agency KCNA previously announced that foreign media would be invited to cover the event to show the process in a "transparent manner." Though in the last week there have been some heated threats from North Korean officials to pull out of the upcoming June 12 summit with President Donald Trump, it appears that North Korean leader Kim Jong Un is still going ahead with closing down his nuclear testing facility. 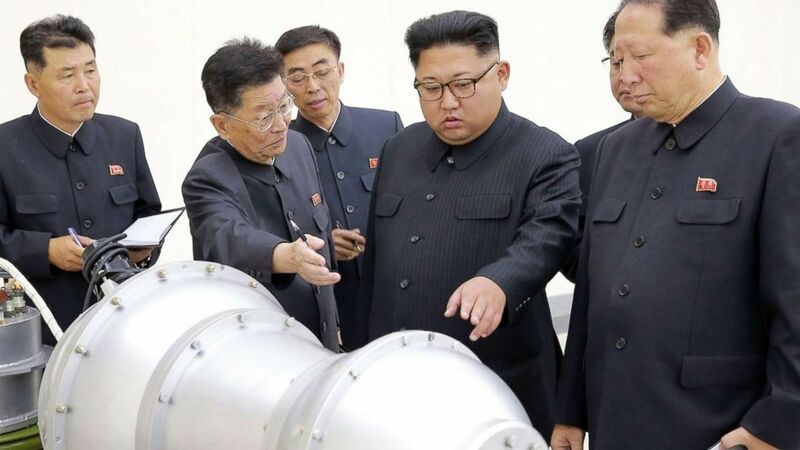 (KCNA via AP Photo) This undated picture released by North Korea's official Korean Central News Agency (KCNA) on September 3, 2017 shows North Korean leader Kim Jong-Un, center,looking at a metal casing with two bulges at an undisclosed location. Kim announced in April that he no longer needed to conduct nuclear tests because the country had achieved its "nuclear weaponization." The nuclear testing site near the village of Punggye-ri in the northeast of the country has been the site of all six North Korean underground nuclear tests from 2006 until the most recent one on Sept. 3, 2017. The facility is built into the granite base of Mount Mantap, roughly 100 miles from North Korea’s border with China and Mount Paektu, an active volcano and the country’s sacred mountain. The hydrogen bomb that North Korea tested in September 2017 was estimated to be at least 10 times more powerful than the one the U.S. dropped on Hiroshima, Japan, at the end of World War II in 1945. Upon detonation it yielded a 6.3-magnitude earthquake followed by a smaller 4.6-magnitude earthquake followed several minutes later. Both the U.S. Geological Survey and the China Earthquake Networks Center described the second event as a possible "collapse" of the site. Two aftershocks were detected in the area as late as December 2017 in a region without a history of natural seismic activity. Until this week, the true condition of the site was unclear because of the restricted access to Punngye-ri. Any analysis had to be done via satellite photographs. 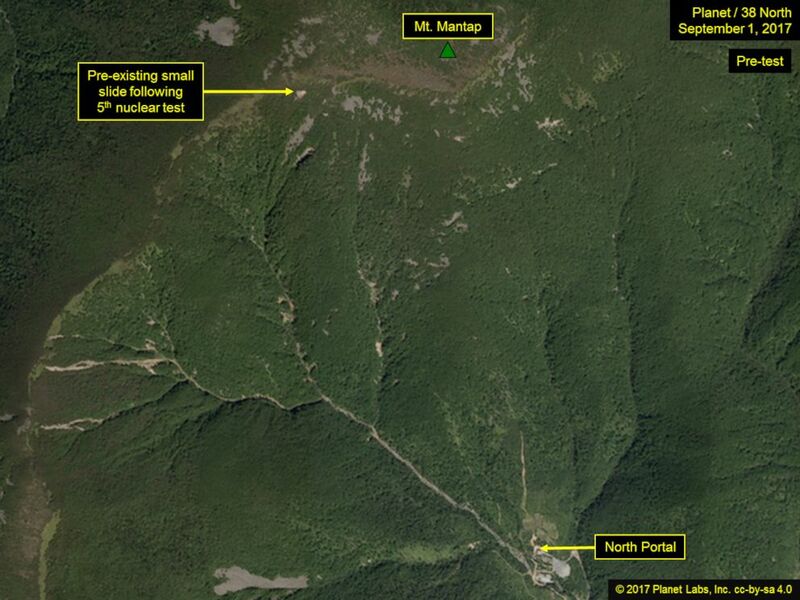 (Planet Labs, Inc.) A satellite image from Sep. 1, 2017, shows a pre-existing small slide on North Korea’s Mt. Mantap. (Airbus Defense and Space/38 North) A satellite image from Sep. 8, 2017, shows a possible subsidence crater and several landslide scars following a nuclear test at North Korea’s Mt. Mantap. In April, a Chinese academic study by researchers at the University of Science and Technology of China suggested that "near vertical on-site collapse toward the nuclear test center" occurred after the initial blast and that the event may have rendered the site unstable for further tests. The study called for monitoring for potential radiation leakage. According to South Korean President Moon Jae-in's spokesperson Yoon Young-chan, however, Kim told Moon at their April 27 inter-Korean Summit that the site had new tunnels that were "in very good condition." 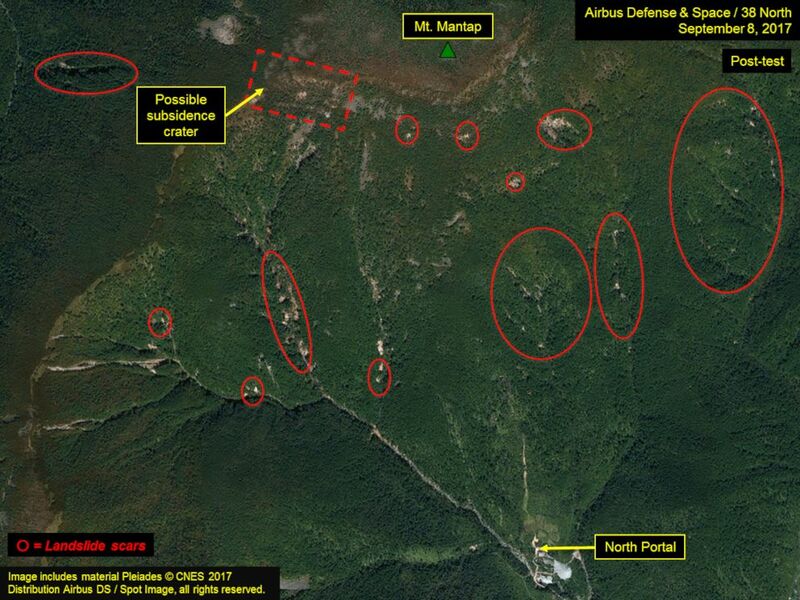 Analysts at the U.S.-based North Korea-monitoring website 38 North appeared to back up Kim’s claim in a April 30 report saying they see evidence that "the two mountainous areas accessible by the South and West Portals remain viable, and could support future underground nuclear testing if there were to be a political decision to do so." On May 12, North Korean state media said the dismantlement process will involve "collapsing all of its tunnels with explosions, blocking its entrances, and removing all observation facilities, research buildings and security posts." 38 North reported last week that in the beginning of May the North Koreans began taking down buildings and infrastructure around the testing facility and appear to have built an observation platform for the visiting media this week. 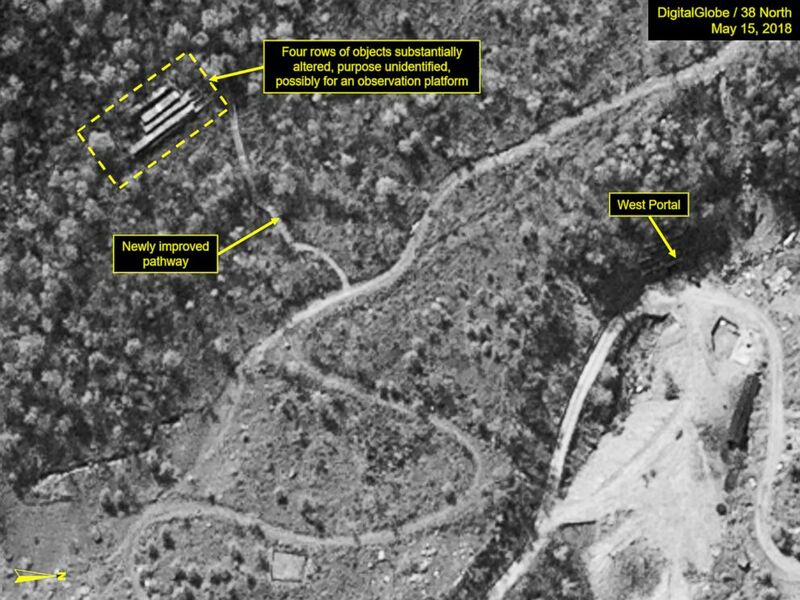 (DigitalGlobe/38 North via Getty Images) A satellite image from May 7, 2018, appears to show ground scarring with four rows of objects at North Korea’s Punggye-ri nuclear test site. 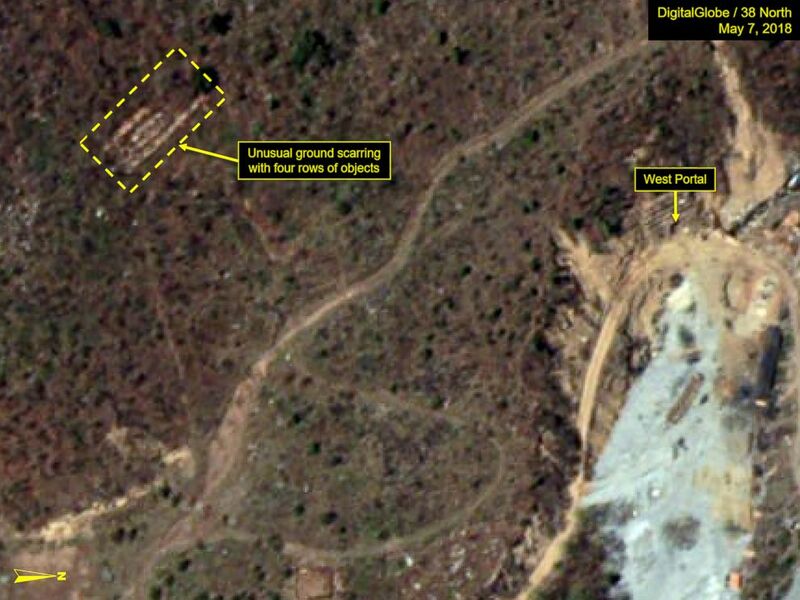 (DigitalGlobe/38 North via Getty Images) A satellite image from May 15, 2018, appears to show significant work that has been done on an area at North Korea’s Punggye-ri nuclear test site. If the political winds change once more, the collapsed tunnels could easily be re-excavated. Ankit Panda of Asia-Pacific affairs magazine The Diplomat reported that a U.S. intelligence assessment determined it would take mere "weeks to months" for Pyongyang to reverse course.